I am English but decided from the start to bring my daughter up as bilingual, and decided on Spanish as the second language, which I had learnt at college, and is spoken in many places around the world. I had been looking for a while for a nursery rhyme CD in both languages, so the Baby Boom Boom CD was absolutely perfect! The instruments are also great quality and add fun to listening. Recently I did a long car trip with my 22 month old who is normally a nightmare to keep occupied in the car, and the CD kept her quiet the entire way there and back! Amazing! It was very well pronounced etc too, although the numbers pronounced in South American way rather than Spanish way, but not a significant thing. Of course, you don't have to have a bilingual child to use these products, they are a great way of introducing a second language to babies and toddlers. Young children have a special gift for absorbing languages that we adults no longer have, and they are like little sponges! These would therefore make a great unique Xmas gift for a baby or young child. The junior band-bag comes with a babyboomboom CD (you choose English plus the other language), along with a tambourine, a recorder, a castanet and a maraca. The CD features nursery rhymes and songs in English and a second language, depending on which one you choose. Each verse is sung in English then repeated in the second language. Words in both languages are included with the CD. Junior band-bags are tested from 10+ months recommended from 3+ years. However, my daughter is only 22 months and she loves it, do I would say from +18 months personally. 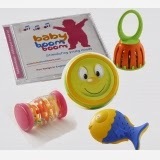 The baby band-bag comes with a babyboomboom CD (again you choose English plus the other language), along with a baby drum, a rainbow-shaker, a “fishy shake-shake” and a cage-bell. 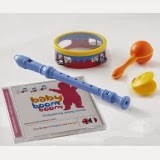 All the instruments are ideal for small hands to grasp and play. This is a musical, fun and participative way to familiarise youngsters with the sounds of a second language! Each verse is sung in English then repeated in the second language. All the words are included for both languages. Instruments in the baby band-bag are tested from 3+ months but recommended from 6+ months. You can also buy the CD separately for £9.99, or do a digital download. As an educational gift I can highly recommend, and it's great value too.